Youth soccer referees are independent contractors, not employees of any club, and are free to officiate for whatever organization they like. 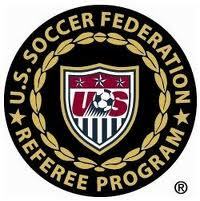 WBYS assigns to games referees, who through the Connecticut State Referee Program (CSRP), have earned certification through the United States Soccer Association (USSF) referee program. If you have any comments or questions, please email the ( . If you have previously been assigned games with WBYS or the Shepaug Soccer Club, and would like to officiate for the current season, complete our preseason referee survey. If would like to register to officiate games for WBYS and SSC, and have not previously been assigned games, complete our registration form. The CSRP typically offers entry-level referee certification late summer through mid-December. Candidates must be 13 by the following June to participate in the program. Generally, the CSRP program consists of a series of online webinars and a full day of instruction/review. Candidates who pass a 100-question, multiple choice test at the end of the in-person session earn USSF certification. Each fall, officials must re-certify by Nov. 30 for the following year. Any referee missing the recertification deadline must go through the certification process from the beginning.